is that all of us tend to put off living. blooming outside our windows today. If you want to conquer fear, don't sit home and think about it. Each nation feels superior to other nations. That breeds patriotism - and wars. The ideas I stand for are not mine. I borrowed them from Socrates. I swiped them from Chesterfield. I stole them from Jesus. And I put them in a book. If you don't like their rules, whose would you use? We all have possibilities we don't know about. We can do things we don't even dream we can do. in which we have contact with the world. how we look, what we say, and how we say it. then tell them what you've said. If you can't sleep, then get up and do something instead of lying there worrying. It's the worry that gets you, not the lack of sleep. that you had thought could never be yours. it depends solely on what you think. is willing to do and dare. The sure-thing boat never gets far from shore. important than the clothes she wears on her back. then let nothing hold you up in your work. Much of the best work of the world has been done against seeming impossibilities. The thing is to get the work done. There are always three speeches, for every one you actually gave. and the one you wish you gave. fail to keep the attention of their listeners. but content themselves with a mediocrity of success. the things he treasures most. First ask yourself: What is the worst that can happen? Then prepare to accept it. Then proceed to improve on the worst. has their happiness in another's keeping . Every time you conquer one it makes you that much stronger. to take care of themselves. but by worry, frustration and resentment. Thank you for visiting: Create happiness for others. 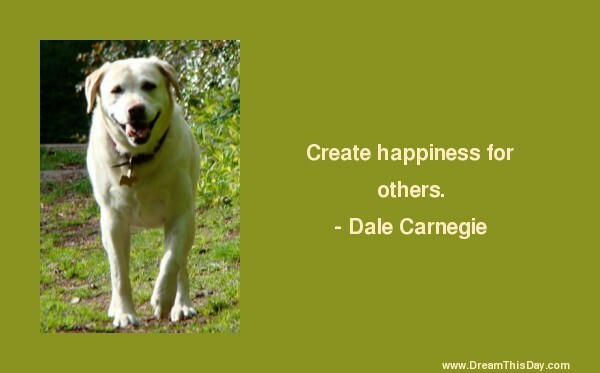 ... by Dale Carnegie from life Quotes and Sayings.